All this week is Awards Poll Week at NHL.com, where our collection of staff writers is stating a case for each finalist in some of the League's major post-season awards. We have opinions and we're not hesitant to share them. Hart Trophy-nomination veterans Sidney Crosby of Pittsburgh and Alex Ovechkin of Washington welcome newcomer Henrik Sedin of Vancouver into the running for the 2010 award. You can also find all three names atop the NHL's regular-season scoring list. The Hart Memorial Trophy is presented annually "to the player adjudged to be the most valuable to his team." The winner is selected in a poll by the Professional Hockey Writers' Association in the 30 NHL cities at the end of the regular schedule. 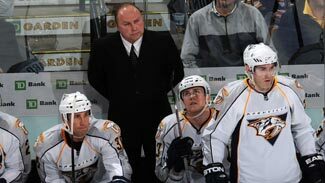 The winner will be announced at the 2010 NHL Awards, to be held in Las Vegas on June 23. The ceremony will be broadcast live from the Pearl Concert Theater inside the Palms Hotel Las Vegas on Versus in the United States and CBC in Canada. On the surface, choosing a winner for the Hart Trophy would appear to be a difficult one. But after careful examination, there's little doubt that Pittsburgh's Sidney Crosby deserves the title "Most Valuable." For starters, the three-time All-Star tied for the League-lead with a career-high 51 goals, marking only the second time in franchise history that a Penguin led the NHL in that category -- Mario Lemieux had 69 in 1995-96. Crosby also led the League in hat tricks (3), was the most proficient player in the shootout (8 for 10) and took (1,791) and won (1,001) the most faceoffs of anyone in the League. He also ranked eighth in faceoff winning percentage (55.9) among players taking at least 1,000 draws. While one could argue the three finalists had similar offensive numbers, what makes Crosby's season all the more remarkable is the fact he didn't really have the supporting cast of his counterparts. Washington's Alex Ovechkin had linemates Nicklas Backstrom and Mike Knuble for support, and Vancouver's Henrik Sedin had brother Daniel and Alexandre Burrows. Crosby centered a line with less-dangerous teammates Bill Guerin and Chris Kunitz. That's no slight on Guerin and Kunitz -- but, let's face it, Backstrom finished fourth in the League with 101 points and Daniel Sedin was 12th with 85 points. Neither Guerin nor Kunitz ranked among the top 127 scorers this past season. Crosby, the 2007 Hart Trophy winner, also played a bigger role in his team's offense – he was involved in 42.4 percent of his team's scoring, as compared to Sedin (41.1 percent) and Ovechkin (34 percent). On top of that -- although it won't have any bearing on this year's winner -- it's hard to ignore the 2010 Olympics and what Crosby did for Canada, scoring the gold medal-winning goal against the U.S. But there's more. In addition to being a great ambassador to the League, Crosby took on an even greater load this season when Evgeni Malkin missed significant time to injury. Let's not forget, Ovechkin missed four games due to two separate suspensions (Dec. 3-5; March 16-18) and most of three games after being assessed a League-high three game misconducts. The Caps, incidentally, were 9-1 with Ovechkin out of the lineup. If you recall, Crosby finished third in League scoring last season but didn't get nominated for the Hart Trophy while Malkin, who led the NHL in points, finished runner-up to Ovechkin. At the time, pundits claimed that Malkin didn't win because Crosby was part of the team. That same argument won't work against the Pittsburgh captain this year, however, since Malkin produced career-low totals across the board. Expect "The Kid" to garner his second Hart Trophy in four years on June 23 in Las Vegas. Sidney Crosby ramped up the debate on which player is the NHL's best by hitting the 50-goal mark this season. The problem is that there isn't a true way to determine the best because Crosby and Alex Ovechkin, both world-class competitors, play different styles, different games -- and neither goes about his business the wrong way. Frankly, if they wanted to split the Hart Trophy this year in half to both of them, yours truly wouldn't have much of an argument. However, facts are facts and Ovechkin again has a small leg up on Crosby because he was the best player in the regular season on the best team in the regular season. He should win his third straight Hart Trophy and join an elite fraternity of players who have done so. The current membership includes Bobby Orr and Wayne Gretzky, who won it eight consecutive years. 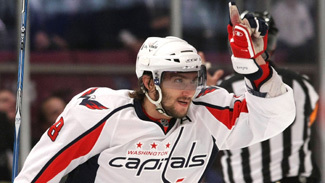 Ovi and Crosby had the same amount of points (109) and each got to 50 goals, but Ovi did it in nine fewer games. He also finished with a plus-45 rating as opposed to Crosby's still excellent but totally inferior plus-15. Henrik Sedin is the third man in this race because he didn't have enough goals (29) and nearly half (40) of his 83 assists were secondary assists. He won the Art Ross Trophy for leading the League with 112 points, but Ovechkin and Crosby both had way bigger impacts for their teams. He had 50 goals in only 72 games, putting him on pace for 57 had he played in all 82 games. All he would have needed was 52 goals to win his third straight Rocket Richard Trophy. But we don't need all those would-haves and could-haves with Ovi. His numbers through 72 games were good enough and his impact even greater. He was the reason Washington won the Presidents' Trophy with 121 points. Let's remember that this trophy goes to the MVP of the League -- and for the third straight season nobody was more valuable than Ovechkin. He should dance with the greats like Orr and Gretzky because he was again great like them. How about because he was the best player in the better conference? Isn’t that enough of a reason? Sedin led the League in points (112) and his 83 assists were the most for a League leader since San Jose’s Joe Thornton had 92 during his Hart Trophy season of 2005-06. The 29-year-old helped push the Canucks from 13th in goals in 2008-09 to second in the League in 2009-10. 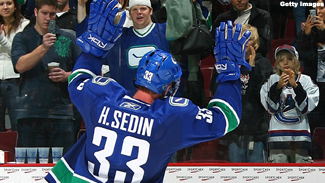 Sedin also does something that every MVP candidate should do -- he makes his teammates better. Just take a look at the breakout seasons of Mikael Samuelsson and Alexandre Burrows, two players not known for their scoring touch. Samuelsson’s career high in goals before this season was 25 in 2005-06 with the Red Wings. With Sedin playing as his center for parts of 2009-10, Samuelsson scored a career-best 30 goals with Sedin assisting on 10 of them. But the more impressive feat by Sedin was how he turned Burrows, known more as an agitator than a finisher, into a goal scorer. Of Burrows’ 35 goals this season, Sedin assisted on 23 of them. Not that last season can factor into this season’s MVP debate, but Sedin was just as instrumental in Burrows’ 28-goal campaign in 2008-09. If you believe the scoring race is too close to give Sedin, Crosby or Ovechkin the edge, why not look at what they offer on the other side of the ice. While Ovechkin was far and away the plus-minus leader at plus-45, Sedin was fifth in the League at plus-35 while playing in the far superior Western Conference. Crosby, meanwhile, was just a plus-15. By pushing aside name recognition and focusing only on what these players accomplished on the ice this season, Sedin gets my vote.